The new report, ‘The cyber security journey – from denial to opportunity’, warns businesses against falling into dangerous traps as they deal with the complexity of securing a digital enterprise. These include being stuck in ‘Denial’ and ‘Worry’ phases at one end of the spectrum, and ‘False Confidence’ and ‘Hard Lessons’ at the other end. While the report stresses that investment in technology such as firewalls and antivirus protection is essential ‘good housekeeping’ practice at the start of the security journey, firms should avoid throwing money away on IT security products as a knee-jerk reaction. This is especially true for companies that have matured from the stage of ‘denial’ into the stage of constant ‘worry’, where investing in the latest technology can be viewed as the silver bullet to the problem. This common mistake can make firms a target, not just for cyber criminals, but also for over-zealous IT salespeople. Businesses must first assess their current controls against best practice, such as the guidance issued by the UK’s National Cyber Security Centre, to help identify any gaps and prioritise essential areas in which to invest. Furthermore, everyone in the organisation, from the board down, must take responsibility for maintaining high standards of cyber hygiene, while businesses must invest in training and raise awareness amongst staff. This can help turn employees from the weakest point in any security chain into every company’s greatest asset in the fight to protect data. “The global scale of the recent ransomware attacks showed the astonishing speed at which even the most unsophisticated of attacks can spread around the world,” warns Mark Hughes, CEO, BT Security. “Many organisations could have avoided these attacks by maintaining better standards of cyber hygiene and getting the basics right. These global incidents remind us that every business today – from the smallest sole trader through to SMEs and large multinational corporations – needs to get to grips with managing the security of their IT estate, as well as their people and processes. David Ferbrache, technical director in KPMG’s cyber security practice, adds: “The recent spate of cyber-attacks is keeping cyber risk at the top of the business agenda, and as such investments are being made. The business community needs to avoid knee-jerk reactions as cyber security is a journey – not a one size fits all issue, and getting the basics like patching and back-ups right matters. “It’s important to build a security culture, raise awareness amongst staff, and remember that security needs to enable business, not prevent it. 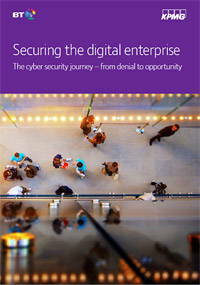 “Cyber threats are evolving and businesses face ruthless criminal entrepreneurs. The solution isn’t jargon ridden technology silver bullets but one that involves a community effort in a world where business boundaries are vanishing. The report also argues that overly complex IT architecture can worsen security gaps. This is especially the case if the technology deployed is too difficult to use or there’s a lack of integration.